Happy hour is meant to be fun, but if you’re watching your weight, those postwork celebrations can make you feel more guilty than happy. If this sounds familiar, here are nine strategies so you can raise your glass and your spirits. Happy hour is meant to be fun, but if you're watching your weight, those postwork celebrations can make you feel more guilty than happy. If this sounds familiar, here are nine strategies so you can raise your glass and your spirits. 2. Strategize splurges. Gearing up for a fun evening? Make smarter decisions throughout the day — opting for the salad at lunch instead of Chinese takeout, for example — so your total calorie count for the day doesn't dip into dangerous territory. 3. Choose low-calorie liquor. Going for one of the many lower-calorie liquor options can often make the difference and help you save calories. Ask your bartender if they serve one of these low-cal, eco-friendly alcohol brands. 4. Alternate with water. Chances are you don't drink enough anyway, and in any case, alcohol is dehydrating. If you're in for a long happy hour session, sip slowly and don't keep going back to the bar for refills; alternate with a glass of water instead. 5. Don't come hungry. You may be dreaming of the chips and dip you'll be eating as soon as the clock strikes 5 p.m., but if you're starving after work, your stomach may do more of the thinking than your willpower. Have a healthy snack in the afternoon so you won't be swayed by all the happy hour specials on the menu. 6. Have a limit. Make post-happy-hour plans so you don't stay so long that you start to get tempted by too many drinks. 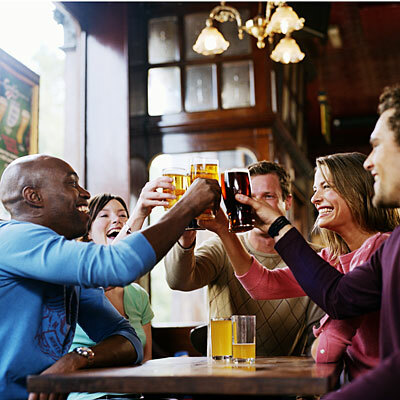 Meet up with friends to cook dinner at home or for a healthier activity in lieu of sitting at the bar. 7. Go for natural. Certain mixers can contain high amounts of refined sugars or overly processed foods. Choose cocktails sweetened with fresh fruit for a healthier libation. This strawberry mojito recipe is a good one to have your bartender make. 8. Have a different kind of happy hour. It's about having fun with your friends, and that doesn't always have to mean cocktails and calories. Meet up for a walk around the park on a nice day, or take that gym class you've all been dying to try. 9. Choose something strong. You'll be more likely to sip slowly if you choose drinks with strong, spicy, or tart flavors, like a scotch on the rocks or a Bloody Mary.